You are currently browsing the tag archive for the ‘nick punto’ tag. I’ve heard you make this statement a couple times, and I’m inclined to disagree. Nick Punto: best athlete on some other team? Maybe. I’m sure it’s true that he can “hit a golf ball to the ends of the earth.” I might have gotten your exact words messed up there; I imagine you’ll forgive me if so. But the best athlete on that team? The one with Joe Mauer? The one with former No. 1 overall pick and arguably current best catcher in the American League, Joe Mauer? 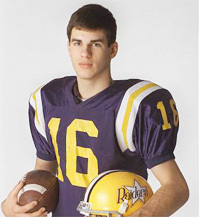 The one with two-time All-State high school basketball player, Joe Mauer? The one with the player for whom back-to-back All-State selections in basketball were an afterthought, because he was the National Player of the Year in football and turned down a full ride to play QB for Florida State in order to play baseball…in which, as previously mentioned, he was the #1 overall draft pick, Joe Mauer? Not that team. For that team, the best athlete is clearly Michael Cuddyer.